I want to make a material that renders its emissive component only at parts of meshes which are not receiving light or maybe receiving light less than a certain amount! This would have been easy in a forward rendering path. As UE4 uses a deferred rendering path, we don't have access to light vectors. 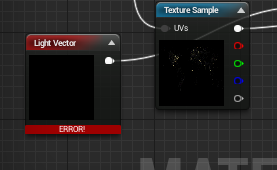 If you had the light vector, you would only need to use the dot product to filter out the lit and dark area of the mesh. Maybe there is a trick that can be used in deferred rendering. Is there anyone who knows how? umm... we do have access to light vectors ! but I dont know how to use it yet it shows error if I link it to multiply function ! This expression is deprecated in Unreal Engine 4 as lighting calculations are now deferred. As far as I know, only light functions can use them. Unreal now has a forward renderer... is this still not possible to easily grab in the material graph? Ah yes, this is a perfect solution if you only need one light source. Question though, don't you need to normalize the vectors? Dot product can be quite unreliable if you do not normalize the vectors. How does normalization cause a messy material? It is just one node for each vector. Maybe I misunderstand your reply.